Healthcare has many data-rich opportunities which can be used to improve cycle times, customer satisfaction scores, wait times, capacity/throughput, and inventory. In honor of Healthcare Quality Week October 21-27, 2018, National Quality Month in the US in October and World Quality Month in November, we wanted to share this helpful how-to on value stream mapping, or VSM. Value stream mapping can help you map, visualize, and understand the flow of patients, materials (e.g., bags of screened blood or plasma), and information. The “value stream” is all of the actions required to complete a particular process, and the goal of VSM is to identify improvements that can be made to reduce waste (e.g., patient wait times). How are Value Stream Maps (VSMs) applied to healthcare? When used within healthcare, one obvious application for VSM is mapping a patient’s path to treatment to improve service and minimize delays. To accurately map a system, obtaining high-quality, reliable data about the flow of information and the time a patient spends at or between steps is key. Accurately timing process steps and using multi-departmental teams is essential to obtain a true picture of what’s going on. In this example, the first step a patient takes is to visit his general physician (abbrev. “GP” above), and this is represented as a rectangular process shape in the VSM. The time the patient spends at this step can be broken down into value-added (“VA”) and non value-added (“NVA”) cycle times. VA is time the customer is willing to pay for: that is, the 20 minutes spent consulting with the GP. NVA is the time the customer is not willing to pay for, i.e., the 20 minutes spent in the waiting room before the appointment. The dotted line arrow between process steps is called a push arrow. This shows that once a patient completes a step, they are “pushed” to the next step. This is inefficient, and a more efficient process can be designed by changing push steps to continuous flow or "pull" steps. The yellow triangles indicate the time a patient spends waiting for the next process. These steps are a non-value added action for the patient. While VSM can certainly be done by hand on paper, using computer-based tools like those in Companion makes the process a lot easier. For example, Companion automatically calculates and displays a timeline underneath the VSM, which adds up the total time to go through the entire system (aka “lead time”) and displays summary information. By identifying all of the steps, you can start to map the whole process out, moving from left to right. Once you have mapped out the entire system, an ideal future state map can be created, and possibly a series of future states in between. These can identify areas for improvement, and once implemented, they can become the “new” current state map as part of an iterative quality improvement process. How do you improve the current state map? When looking for areas of improvement, try to focus on changes to improve the flow of patients through the process. Continuous flow is the ideal and moves patients through the system without them having to wait. However, continuous flow is not always possible, so instead other changes might be introduced—such as first-in first-out (FIFO). Also be sure to take a look at the takt time, which can help you decipher the pace of customer demand. In this case, takt time can be interpreted as the number of patients that can be treated per unit of time. Companion will calculate takt time automatically. Once you have completed the current and future state maps, you can compare the two, quantify improvement opportunities, and look at how to implement the changes. In this example, the triage and sort/appointment steps might be combined so that fewer visits to the hospital were required by the patient and they receive treatment faster. Our previous blog posts Five Guidelines You Need to Follow to Create an Effective Value Stream Map and Four More Tips for Making the Most of Value Stream Maps also share some helpful tips. 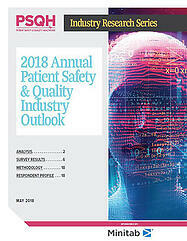 Patient Safety & Quality Healthcare also recently released their 2018 Annual Patient Safety & Quality Industry Outlook, sponsored by Minitab. Download the report to learn more about quality management challenges in healthcare.